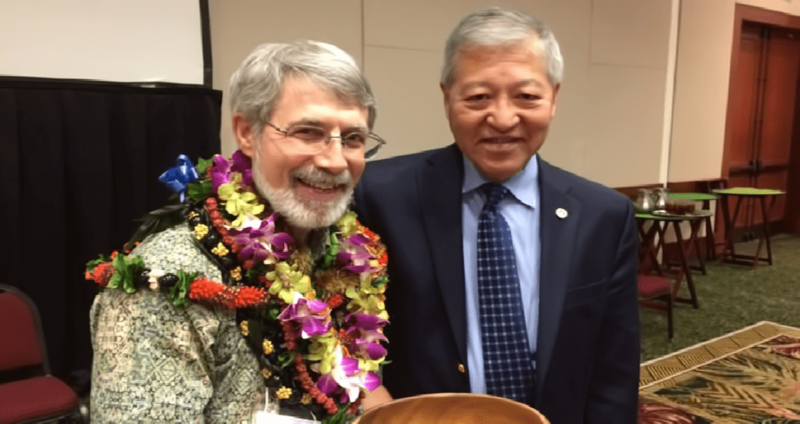 Dennis Dunn, director of the Victim Witness Kokua Services division of the prosecutor’s office, was recognized for his work on behalf of victims of crime at the Institute on Violence, Abuse and Trauma’s 13th Hawaii International Summit. At a luncheon at the Hawaii Convention Center, Dunn was named a co-winner of the Loretta “Deliana” Fuddy Lifetime Achievement Award. Marya Grambs, executive director of Mental Health America of Hawaii, was the other winner. “I have had the privilege of working alongside Dennis for more than 30 years and can personally attest to his tireless efforts on behalf of victims of crime,” Prosecuting Attorney Keith M. Kaneshiro said. “When Dennis began working for the prosecutor’s office in 1979, victim services were not a priority and the impact of crimes upon victims was a secondary concern. “Dennis changed that attitude by expanding services in Honolulu and also being a strong advocate for laws that were victim-oriented. Dennis played a key role in the creation of laws that gave victims a voice in the criminal justice system so they now can testify at sentencing or parole hearings. In its write-up, IVAT noted that Dennis has “been actively involved in the drafting and passage of many of Hawaii’s most important victim’s rights statutes. Dennis helped me at the time of my DV abuse and he continues to be an advocate.